Responses of many day-to-day mechanical devices are affected by the interaction between solid and fluid phases. The list of such devices includes familiar names such as valves, pumps, compressors, shock absorbers, airbags, anti-lock braking systems (ABS), fuel tanks, turbines, journal bearings, loudspeakers and many more. In this News, we present two studies of such devices, in each case the fluid-structure interaction effect is essential. The first example is a hydraulic engine mount. These devices are used to isolate the vibration caused by the engine and provide a better driving experience. Hydromounts consist of a rubber chamber filled with viscous fluid. The finite element model of different components of the hydromount is depicted in Figure 1. The displacements caused by the engine vibration are transferred to the rubber wall and the deformation of the rubber wall causes the viscous fluid to flow through a channel connecting the two fluid chambers, hence dissipating the input energy and isolating the engine vibration. The stiffness and damping of the coupled rubber-fluid system, in general, are frequency and amplitude dependent due to the viscosity of the fluid and material nonlinearity and large deformation experienced by the rubber. 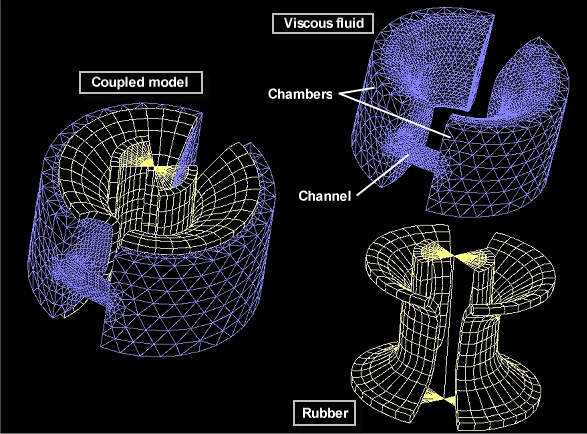 The animations below show the deformations of the rubber wall and the velocity vector field in the fluid chambers. The rubber wall is modeled using the Mooney-Rivlin material model while the fluid is considered viscous and incompressible. A step-by-step time integration is used to solve for the fully coupled response of the fluid-structure system. In the second example, the response of a membrane valve (diaphragm valve) system is considered. The finite element model of the valve system is presented in Figure 2. Increasing pressure in the inlet of the tube increases the fluid velocity. This causes an ascending dynamic pressure on the membrane. Hence, the membrane deforms and almost closes the valve. The animation at the top of the page shows the effective stress contour plot in the membrane as well as the velocity vector field in the fluid region. The animation below shows a close-up of the region surrounding the membrane. These case studies illustrate some of the advanced capabilities of ADINA for solving mechanical design problems where fluid-structure interaction effects are important and the response of the structure may involve severe nonlinearities and strong couplings. For more information on ADINA FSI, refer to our fluid-structure interaction page where we have provided an overview of the features, many case studies, and a list of more than 150 publications in which researchers have used ADINA FSI for solving a wide range of challenging fluid-structure interaction problems.